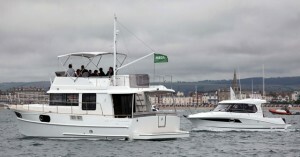 The support boat fleet is ready for Olympic duty at the London 2012 Games, which begin July 27. The Olympic Games is a major undertaking - and not just on land, but also at sea. 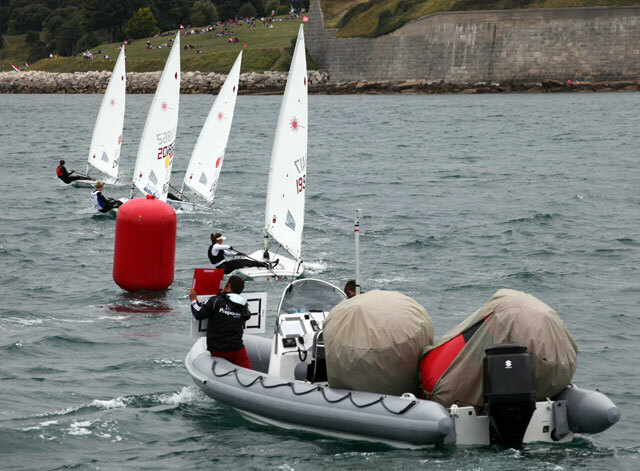 As an island nation and a powerful player on the international sailing stage, Britain was always likely to give particular focus to the sailing events hosted out of the Weymouth and Portland Sailing Academy, so LOCOG (the London Organising Committee of the Olympic and Paralympic Games) has had a very big job to do. 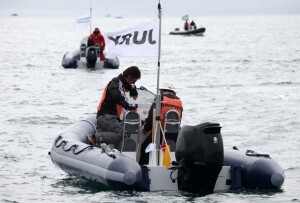 They needed to find a powerboat fleet that would be capable of carrying out a great many tasks in front of a global audience of four billion. As well as catering to the international press and the hoards of VIPs, these boats would need to be able to organize and marshal a top class sailing regatta. 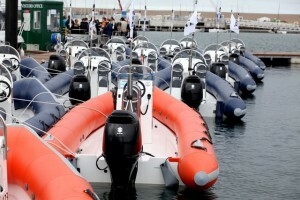 And that fleet has now been put in place, courtesy of Ribcraft and Beneteau. While Solent RIB Charter of Lymington is supplying 24 charter RIBs, the big player on the rigid inflatable side of things is Ribcraft. 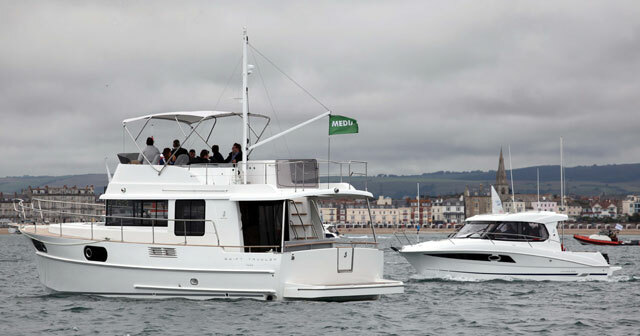 Based in Yeovil, Somerset, Ribcraft was awarded the contract to manufacture 64 craft for use as platforms for jury work, umpiring, mark laying and measurement roles. 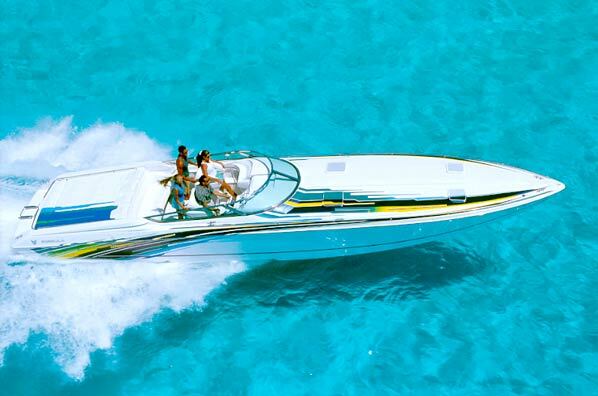 The Ribcraft fleet was built in just six months and comprises 44 of the popular 5.85 models and 20 larger 750 craft. The 5.85s come in two different layouts. The first layout consists of a single-seat jockey console with hatch, windscreen and grab rail, while the second layout features a more relaxed, side-by-side seating arrangement and a console with access hatch and stainless steel wraparound grab rail. Aside from these minor variations, the spec of the 585s have received no special modifications for Olympic duty. These boats look like a particularly good choice. In addition to the extraordinary build strength you would expect from Ribcraft, with its extensive commercial boat building background, the 585 is a very well proven size. 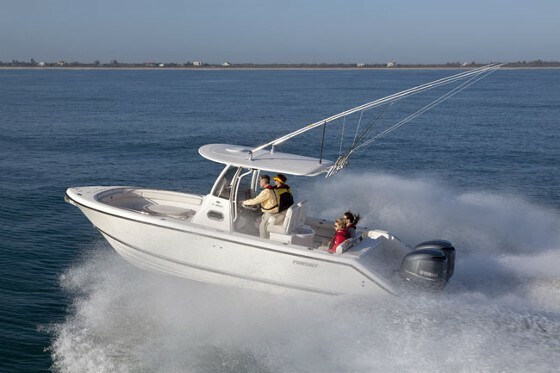 It has been honed over years of on-the-water action and comes with a sheer, elevated bow, a deep-V hull and full-length spray rails. The result is a very soft and dry ride, and that is likely to be a big plus for the Olympic drivers. The larger Ribcraft 750 is designed to offer the recreational user serious offshore ability, with sleeker lines and more rapid performance than the Professional range. It is also designed to offer greater security to passengers, with a deck that sits lower in the boat than many comparable RIBs. In addition to the classic deep forefoot and soft ride so familiar to Ribcraft users, the internal space of the 750 will be valuable for laying buoys and marks during the Olympic sailing events. 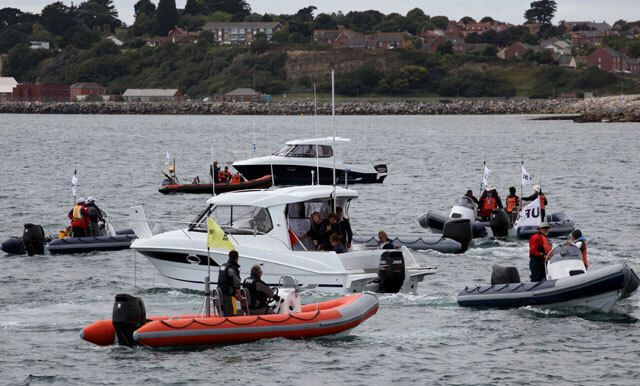 But it’s not just about the Olympics for this RIB fleet. After the Games are over, four of the mark-laying RIBs will be donated to the Royal Yachting Association to help support the sport and to run more high-profile sailing events in the future. 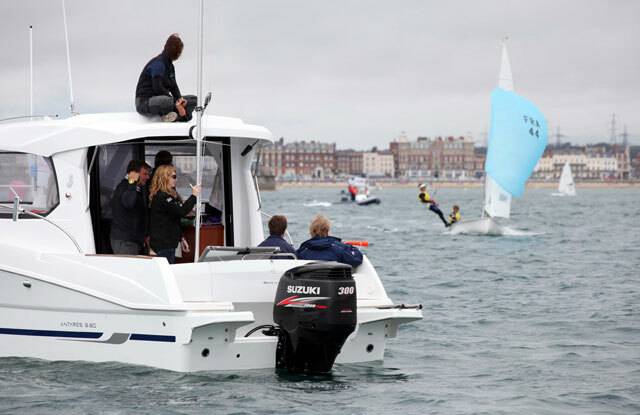 And around half the fleet will be made available for resale, as Jason Purvey of Ribcraft explains: “All the boats will be fully serviced and in A1 condition before we sell them on after the Games. 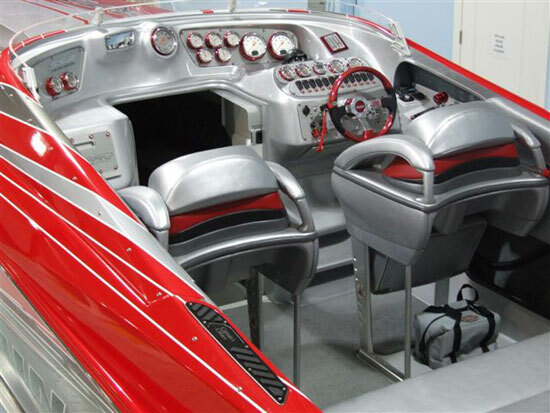 We can further customize these boats to suit the buyer’s requirements with the additions of trailers, extra seating and ‘A’ frames and they will have a complete ‘as new’ warranty.” The company has also negotiated with Suzuki, the main engine supplier, to offer the boats as complete packages with discounted engines. Of course, a fleet of RIBs would never be enough all by itself. In addition to the practical work of preparing and overseeing the race events themselves, the world’s journalists and photographers will also be in need of reliable transport and viewing platforms - as will the various VIPs and heads of state who are expected to attend the Olympic sailing events. LOCOG’s choice is a fleet of 23 Suzuki-powered Beneteaus. That fleet consists of Antares, Barracudas, and Swift Trawlers, and given the key qualities required, that would appear to be a very sage decision. These craft all offer plenty of deep, secure internal space, plus panoramic, uninhibited views of the action and great freedom of movement for those on board. 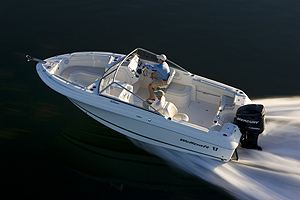 In total, there are eight models of boat across four product lines. From the four-strong Antares line, LOCOG selected the two largest in the form of the 7.80 and 8.80. These practical, fisher-style craft provide big aft decks and extended swim platforms to help maximize external space. Inside, the cockpit is designed to offer excellent visibility, with impressive headroom, expansive windows, and additional see-through roof panels to improve natural light. With trim tabs and bow thrusters on the 8.80, plus a double berth and a separate head compartment, these are very well-appointed craft, despite their modest length. LOCOG also chose six Barracuda 9s - five of them with the optional two-man fly and one without. 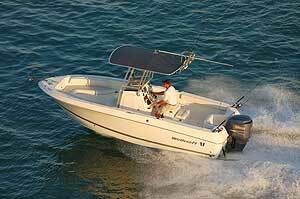 And while all six are very sporting craft, with the famous Beneteau ‘Airstep’ and a powerful, boldly flaring bow, one of the key reasons the Barracuda was chosen was its performance in a crosswind. The test days showed minimal windage and very commendable controllability at close quarters, which will be extremely handy for the Olympic drivers. They are likely to be used as relay and finish line boats. Finally, right at the top end, Beneteau’s Swift Trawler line-up is fully represented in the Olympic fleet with a pair of 34s, four 44s, and two of the flagship 52s. These traditional looking boats are designed to offer huge internal space, big cruising range and excellent stability at sea - and it is for this reason that they are to be used as press and photography platforms. They will also be used as viewing platforms for VIPS, partly because their broad open layouts and flybridges offer some of the very best viewing, and partly because they come complete with extremely luxurious on board facilities. 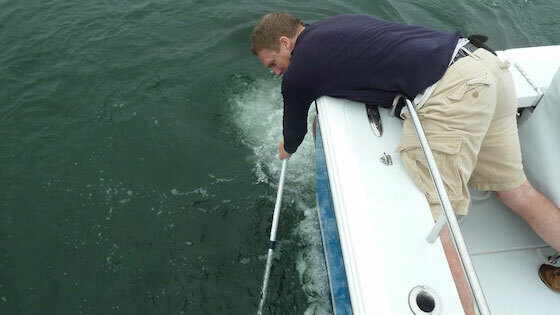 Only the event itself will determine whether the boats chosen are really fit for purpose. But from the evidence of the test days, both the RIB and hard boat fleets have justified LOCOG’s decisions. Stay tuned for more coverage from Weymouth, once the sailing starts on July 29.